The Leading Indicator of Remodeling Activity (LIRA) provides a short-term outlook of national home improvement and repair spending to owner-occupied homes. The indicator, measured as an annual rate-of-change of its components, is designed to project the annual rate of change in spending for the current quarter and subsequent four quarters, and is intended to help identify future turning points in the business cycle of the home improvement and repair industry. Produced quarterly since 2007, the LIRA is released by the Remodeling Futures Program at the Joint Center in the third week after each quarter's closing. What does the LIRA measure? The LIRA measures short-term trends in national spending for improvements and repairs to owner-occupied homes. The LIRA is calculated as a four-quarter moving rate of change in spending and it is benchmarked to historical estimates of remodeling spending based on data from the Department of Housing and Urban Development’s biennial American Housing Survey. Home improvements include activities such as remodeling, renovation, restoration, additions, alterations and replacements of home components which add value to a home or property, while maintenance and repair activities simply preserve the current value of the home. 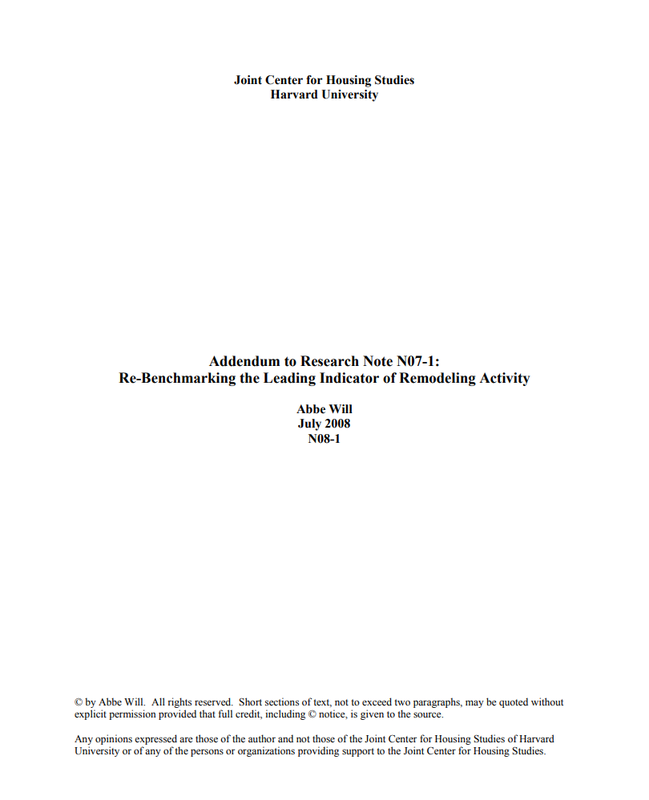 The American Housing Survey does not collect data on remodeling or repair activity to rental units, and therefore the rental segment of the broader residential remodeling market is also not measured or projected by the LIRA. How is the LIRA computed? The LIRA is computed as a weighted average of the annual rates of change in several key economic indicators that typically influence and lead remodeling activity by one or more quarters. The LIRA projects the change in national home improvement and repair spending levels with a time horizon of four quarters. The annual, or moving four-quarter, rate of change produced by the LIRA is the rate of change in national spending in any given four-quarter period to the spending that occurred in the four quarters prior to that period. View an example of how a moving four-quarter rate of change is calculated. How do you read the LIRA chart? The line graph portion of the LIRA chart found in each quarter’s press release are estimates and projections of annual rates of change in the rolling four-quarter sums of national home improvement and repair spending. Historical rates of change are a combination of estimates based on American Housing Survey data and those produced by the LIRA model until new AHS data become available. Projected rates of change are produced by the LIRA model. The bars in the LIRA chart represent aggregate spending levels in that quarter plus what was spent in the prior three quarters (i.e. the value of the bar for 2018-1 is the accumulated spending that occurred during 2017-Q2, 2017-Q3, 2017-Q4 and 2018-Q1). In this way, the fourth quarter bars in the chart represent the amount of spending during that calendar year. Is the LIRA adjusted for inflation? No. All of the LIRA inputs and outputs are nominal. In the case of real measures, such as number of housing starts, sales and permitted properties, for example, the input is first “deflated” using the Consumer Price Index. Which economic indicators are used as inputs in computing the LIRA? 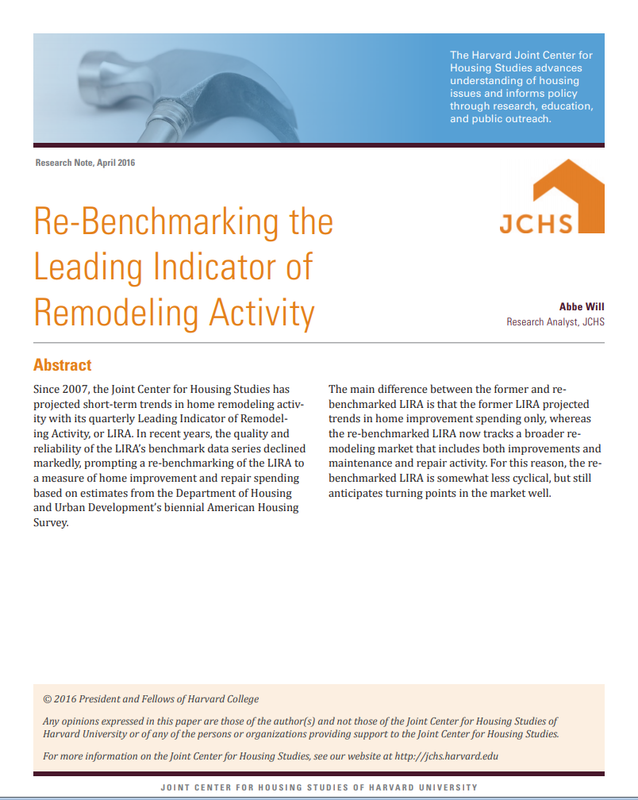 More detailed information on the inputs can be found in Tables 3 and 6 in “Re-Benchmarking the Leading Indicator of Remodeling Activity” (JCHS Research Note N16-4). Is the LIRA available separately for improvements and maintenance/repairs? Although the published LIRA is produced with separate models for improvement and maintenance spending, at this time only the combined output of the separate models is available. Is the LIRA available at a regional, state, or metro level? Timely and routine collection of high quality, detailed remodeling data continues to be a struggle for the industry. 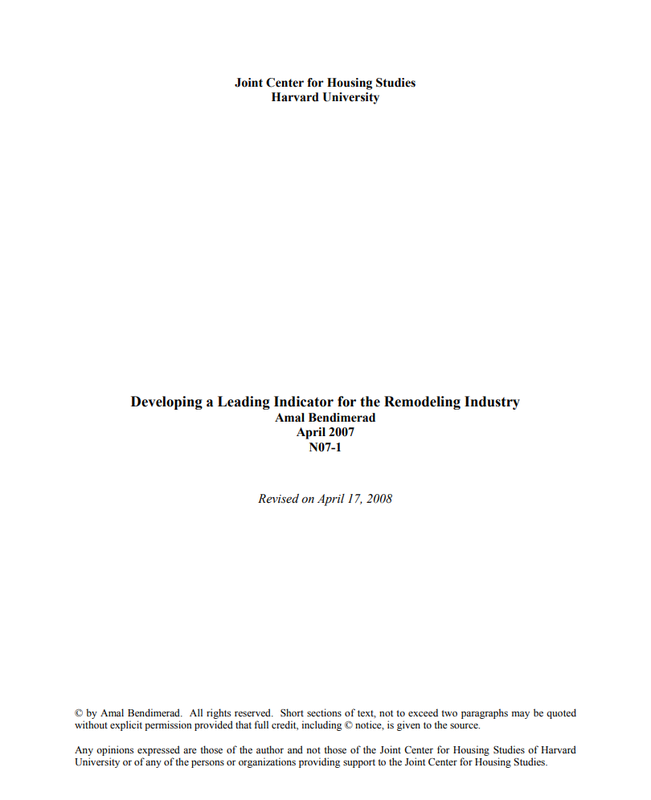 Projections of metro-level remodeling activity using a methodology similar to the national LIRA are forthcoming, and a regional breakdown of historical national improvement spending is available for every other year for the past two decades in the web tables of the Joint Center’s biennial Improving America’s Housing report. Is the LIRA available for specific categories of remodeling project? No. However, data on remodeling spending by project type is available for every other year for the past two decades in the web tables of the Joint Center’s biennial Improving America’s Housing report. Is the LIRA available by professionally-installed vs. DIY projects? No. However, data on remodeling spending by installation type is available for every other year for the past two decades in the web tables of the Joint Center’s biennial Improving America’s Housing report. Why do the estimates of remodeling spending levels released quarterly with the LIRA differ from the market size estimates routinely included in the Joint Center’s Improving America’s Housing reports? The difference is that the LIRA only includes home improvement and repair activity to owner-occupied properties, whereas the Joint Center’s broader market size also includes improvement and repair spending to rental properties.